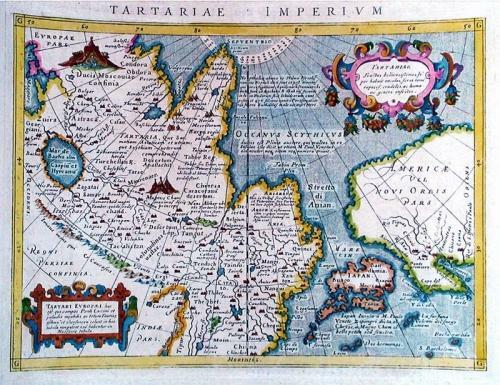 Fine miniature map based on Ortelius. The map focuses on the North Pacific, including Northwestern America and Japan. While designed to illustrate the expansive Kingdom of the Great Khan in Asia, its main feature is the Stretto di Anian and its depiction of Northwestern America. The map covers northern Russia, China, and an early depiction of Japan, which is located just off the American shore. It is decorated with two elaborate cartouches. On a full sheet of Italian text. Ref: Burden #95 (mapping of North America), state 1 (Venice 1596).